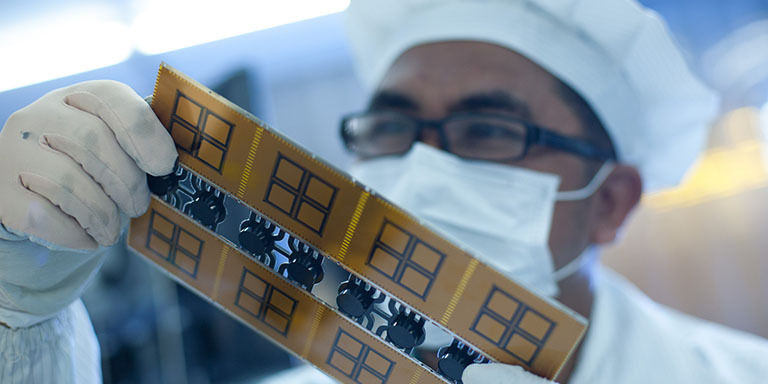 A student examines a printed circuit board at a polytechnic in Indonesia. Photo credit: ADB. Skills development raises productivity, helps build innovative capacity that sets the basis for developing and acquiring new technologies, and makes workers more adept at exploiting them. 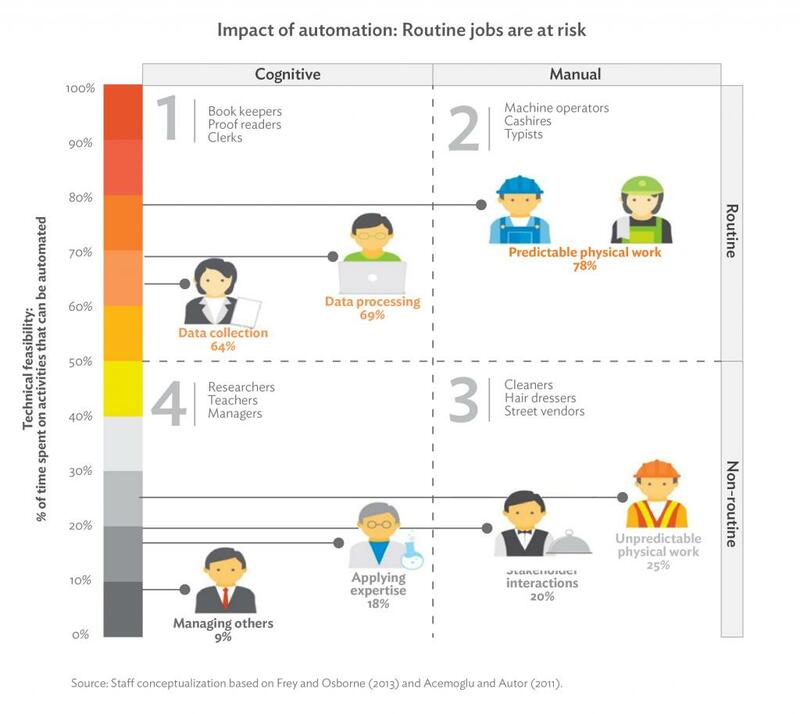 Modern technologies, however, have also put some routine jobs at risk. How can workers keep pace with the changing demands of the labor market? This article is based on the presentation by Asian Development Bank's Rana Hasan at the 7th International Skills Forum in Manila in December 2017. Rapid changes in technology has raised concerns that the skills that students learn in school would be obsolete in 5 years. This has implications on skills development and education, particularly in countries already beset by the problem of skills mismatch. In developing countries, there are efforts to study how technology will affect jobs and what governments can do to address a shorter shelf life of workers’ skills. Rana Hasan, a director of the Economic Research and Regional Cooperation Department at the Asian Development Bank (ADB), says the problem in the developing world is that typically people work in sectors and in companies with low productivity. “The big challenge is in terms of generating better jobs, jobs that are more productive, jobs that generate higher earnings. You’ve got to do something about getting higher productivity sectors going and you need to encourage higher productivity firms to expand,” he says. 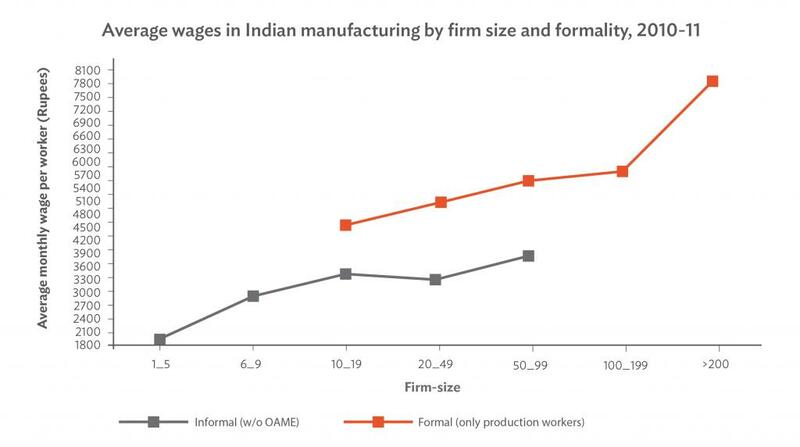 In India, he cites data showing workers in the formal sector enjoying higher wages, which tend to increase with the company size. In other countries, there is also evidence that workers who are better trained are hired by larger firms in the formal sector, and, in turn, work better. One reason is that these firms are able to employ better production and managerial technologies. In order to fill more productive jobs, workers must have the education and skills to carry out the tasks required in the modern workplace. “The skills mismatch problem is a pretty serious one,” remarks Hasan. Workers are either underqualified for certain jobs, or overqualified. He notes that in several countries, people with fairly limited education hold management positions, which they are ill-equipped to handle. The developing world is also facing an emerging issue concerning jobs threatened by the rise of automation. According to various studies, 50% of jobs in the business process outsourcing sector could be at risk of being replaced by automation. Essentially, the jobs that are most at risk are the so-called routine jobs, such as simple data collection and data processing, and those that involve predictable manual work. On the other hand, nonroutine jobs, such as research, teaching, and managing people, are safe, as well as jobs that require unpredictable manual work and those that require human interaction, such as waiting tables. “One of the big challenges we need to start thinking about is preparing workers for non-routine jobs,” Hasan says. Workers need a solid foundation of cognitive and non-cognitive skills and be able to adapt to new technologies and acquire new technical skills. In his slide presentation, Hasan also notes the need for workers to shift from narrow specialization to “learning to re-learn,” trainings that are interwoven with full-time work, and clearer pathways from TVET into higher education and vice versa. He also raises the possibility of a larger role for the private sector in skills development. Amidst all these, technology also presents solutions, he says. For example, there are online platforms that help people find jobs and provide quick feedback to governments and providers of technical and vocational education and training about the prevailing job market. Asian Development Bank (ADB). 2015. A Smarter Future: Skills, Education, and Growth in Asia. A special chapter of the Key Indicators for Asia and the Pacific 2015. Manila. Asian Development Bank (ADB). 2015. Challenges and Opportunities for Skills Development in Asia: Changing Supply, Demand, and Mismatches. Manila. Rana Hasan is the director of the Economic Analysis and Operational Support Division of the Research and Regional Cooperation Department at the Asian Development Bank. He holds a doctorate degree in Economics from the University of Maryland in the United States and completed his master’s degree in Economics from the Delhi School of Economics, University of Delhi in India.